Although Max Gunther (1927–1998) is best recognized for co-authoring the seminal mid-century suburbia panic tome The Split-Level Trap, much of his work fell within the realm of tawdry men’s magazines and spitfire business quick-reads with punchy titles like The Zurich Axioms, Instant Millionaires, and Wall Street And Witchcraft. (He also edited for more straitlaced fare like Time and Business Week.) Add to these his abiding fascination with the “willfully vanished” (he penned “Do-It-Yourself Divorce” for True and the gender-flipped “Wives Who Run Away” for Ladies’ Home Journal), and he seems the perfect candidate to write the “incredible true story of the hijacking, escape, and years of hiding” that D.B. 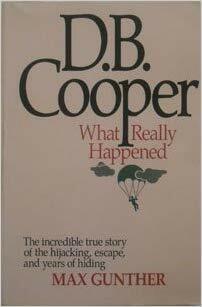 Cooper: What Really Happened purports to be. 2016 was a notable year for the Cooper mystery: after 45 years, the FBI announced that they were “re-allocating the resources directed at the Cooper case” (read: closing it). While some imagined the now-elderly Cooper cracking a smile while scrolling through the announcement on his iPhone (before nonchalantly throwing back his tinto de verano somewhere on the sun-speckled shores of the Iberian Peninsula), others among the new generation of armchair Cooper sleuths—expanding the search ever further into unlikely arenas—saw the move as premature. During these four decades (culminating in the full flower of the internet age), the entire motley oeuvre of Cooper material from 1971 to the present has been obsessively dissected, argued, and adjudicated into semirigid hierarchies based on the veracity and sturdiness of the facts and theories presented. Indeed, the previous owner of my copy of D.B. Cooper: What Really Happened left behind a small garden of marginalia indicating a keen interest in the particulars of the case (for example, helpfully adding “Deceased” beside the names of various key players). These notes, in messy blue ballpoint, serve as a microcosm for how this book is currently viewed by readers well-versed on the topic; they focus on prying apart the cracks which increasingly compound in the narrative. Too many unconfirmed details, uncorroborated timelines, “facts” which appear nowhere else. Most plainly, the entire premise of the novel—a series of phone interviews precipitated by a mysterious letter some ten years after the hijacking—is so clearly far-fetched that Gunther smartly gets ahead of it by opening with a lengthy preface detailing both his own and others’ reasonable suspicions of the whole cloak-and-dagger routine. The only real question is whether Gunther pulled a fast one on his publisher, or whether he pitched the book with a wink and a smile. Meet Clara: a woman who, through a wilting timidity and oppressive family structure, has resigned to watch her dreams fade, uncaught, into the horizon. At the age of 30, she finds herself a recent divorcée from a dispassionate marriage, and begins to feel the insistent tug of time irrecoverable from her sleepwalking life. In the evening, bathed in firelight and the glow of warm brandy, she lays out her suspicion: “You’re the hijacker, aren’t you? D.B. Cooper?” He assents plainly, evenly; and here, with no explosive drama, they sit, content to let the moment fade into a question mark as Cooper falls asleep on the recliner. In not a week’s time, they become lovers. Cooper opens up to Clara. About the hijacking, yes, but more importantly, on matters of the heart. Beyond assumptions of his familiarity with aviation, nowhere in the dull, accurate Cooper corpus do we encounter him so delicately inked, full-featured in humanistic portraiture. After a hardscrabble Depression-era childhood, Cooper strove to overcome his “mousy” disposition by ascending to the vaunted paratrooper corps in the European theater. Returning home, he attended college on the GI Bill, married young, and, with the requisite two children and creeping consumer debt, joined The Silent Generation in blissful suburban conformity. Then, toward the back half of the 60s, with the spark long since faded from his marriage and a pair of college-aged kids striking out on their own, the silver bars of his own personal split-level trap began to press heavy against him. With the aid of Gunther’s expertly penned and intellectually incisive articles (!) detailing the art of disappearance (and a drunkard’s carelessly dropped driver’s license), Cooper abandoned his former life, joining the hazy ranks of the willfully vanished, and tasting, at last, the clarion air of true freedom. He tumbled along with America’s rootless drifters, until eventually growing jaded with their lack of ambition. Cooper is a man of action; capable, detailed, methodic. Stemming from a chance encounter with the much-improved tackle of modern skydiving and a work relocation to Portland, the hijacking plot coalesced almost subconsciously; at first an idle mind game, he kept rolling the idea around to smooth out all of the rough edges, until feeling the inevitable fated pull toward its execution. Suddenly, there he is: strapped with $200,000, blinded by the rushing night air and counting “One Mississippi, Two Mississippi…” as he slices through the clouds, breathlessly praying he hasn’t miscalculated the jump. He and Clara hike through the freshly-fallen snow to recover the satchel of money he hid in the forest to lighten the load on his broken foot. Back at the lake house, they toast glasses of brandy by the fire, using the old leather suitcase into which they’ve packed the banded stacks of twenties as a low table. With a new corona of self-confidence drawn from Cooper’s reassuring presence, Clara is finally able to stand up for herself when her family recoils, aghast, upon learning that she’s living in sin with a new suitor. Cooper likewise reconnects with his beloved daughter via phone; she understands and forgives his need to abandon the family and promises to keep his calls a secret (though he doesn’t confide in her about the hijacking). In time, she develops a loose, affectionate rapport with Clara as well. As winter gently melts into spring, the lovers are now faced with a surprising problem: they are running out of money. Having guessed (correctly) that the serial numbers of the hijacking cash had been cataloged, they are too frightened to spend more than a bill or two at a time—let alone deposit it. And so, with nothing to keep them tied down and the sum total of their worldly possessions packed in just a few bags, they board a plane for the “faraway glitter” of New York City. Clara lands a job with a temp agency and then a small publisher, while Cooper unexpectedly excels as a technically-oriented salesman. The suitcase full of cash begins to collect dust in the attic as the pages of the calendar flutter away and the two settle into domestic bliss. But like any inessential task put off season after season, their secret cache of un-bankable money quietly gnaws at them; especially when they tour a particularly charming home far beyond the reach of their current income. Then, suddenly, while on a business trip to Reno, the radiant chaos and free-flowing cash of the casino hits Cooper like a revelation. walked out of the casino at dawn and watched the sun come up over the Atlantic ocean. The old suitcase was empty at last. Thus forever changed, the couple completes the Hero’s Journey and returns, secretly victorious, to an anonymous, unremarkable life in the suburbs—the ultimate normcore Bonnie and Clyde. Here in this American idyll, Clara blossoms into radiance in a “butterfly-like metamorphosis,” while Cooper finally sheds the last vestiges of his personal mousiness. The bittersweet denouement is set into motion when Cooper is caught in a lie about his past, which leads to his eventual unemployment, and the beginning of blood pressure issues so tragically common to the midcentury patriarch with too much life behind him and too much time on his hands. A moment of pain seizes his chest, then subsides. The next day, in the sparkling white light of morning, D.B. Cooper ascends from our corporeal world into the alabaster pages of history, and the rarified amber of eternal folkloric afterlife. My future wife and I graduated from university as the economy collapsed into shambles; we picked up and moved to the Sacramento Valley. Here in the searing dry summer heat, she landed a job with the Dept. of Water Resources, piloting a small boat through the Delta and recording the silty underwater topography with specialized sonar equipment (later displayed as a stack of inverted rainbow arches floating in endless black space). I ambled through a series of part-time gigs while looking for steady music work, until I fell accidentally into the job which I now most associate with this phase of my life. The Boss was a dot-com era venture capitalist who had managed to cash out before the party turned sour, and with nothing left to inconveniently tether him to reality, had decided—unphased by the ongoing implosion of print media or the fact that he had no prior experience in the field—to indulge in the romantic fantasy of launching a poetry quarterly. After reading some online listicles about running a magazine, he was looking to hire an entry-level fact checker. A brief interview and a sturdy handshake later, I was on the payroll. California is, and will always be, a unique place. Seemingly tasked with little more than emailing poets to verify the spelling of their names (and looking, shamelessly, to pad my invoices), I nobly took it upon myself to expand the notion of fact-checking to poetry. But navigating these linguistic grey areas in nonfiction is a whole other matter. A sure sign of my inexperience, I nearly fainted with a Blanche DuBois gasp when an editor punched up the word “lucrative” to “important” in one my first pieces; the gulf in meaning felt irreconcilable. Just a gentle nudge here or there—an eyebrow “arched” rather than “raised;” a door handle opened “tentatively;” a “nighttime” conversation now “hushed” or “under the stars”—and a nonfiction writer might need to ask herself if she’s crossed a line into something else. But what if the free pass we so often grant to casual metaphor is taken in musical extremis? Max Gunther is indeed telling an “incredible true story,” but it is not the story of D.B. Cooper. It is the story of how Gunther’s penchant for risk-taking successfully carried him through the peaks and valleys of the postwar publishing industry. The “hijacking” and “escape” in question are getting this book on newsstands in the first place, and subsequently delivering a wild yarn precisely calibrated to appeal to just the sort of reader who will pick it up—readers like me: chronic dreamers; painfully ordinary individuals who, secretly, deep-down, want to believe that we too, beneath our unremarkable exteriors, hold the capacity to beat the system, sweep a lover off their feet, get away clean. Ultimately jaded with what he took to be the hopelessly diminished state of “today’s poetry,” after just two months, with not even one full issue completed, The Boss solemnly called us into the office to announce he was closing up shop. (He later went on to open a windsurfing rental business on Lake Berryessa, among other quixotic and quickly-abandoned tangents.) Having understood this apocalyptic development was a distinct possibility, we, the lucky handful of former poetry 9-5ers, plodded down to The Preflight Lounge to hold a wake for our literary aspirations (and comedically bulbous invoices). This was at the old location, before they tore it down to build the Golden 1 Center. Opened in 1972, The Preflight Lounge was named unironically: it sat hidden behind an unassuming glass entryway and a twist of concrete stairs in the basement of a shopping mall, next to a parking garage where shuttles would whisk passengers to the new Sacramento Metropolitan Airport. The decor had remained largely unaltered for the duration, frozen in time, in luscious, worn-out blood orange and burnt ochre. The squat, neon-sided jukebox was (and, I imagine, remains) immaculately stocked. Here we toasted to the good times and the uncertain future. We shout-sang along with Blondie and The Go-Go’s, slipping further and further into the jagged fuzz of cheap whiskey. We promised we’d stay in touch forever. We partied all night long. Devin Smith is a musician and writer in San Francisco. See his website for a full list of projects.